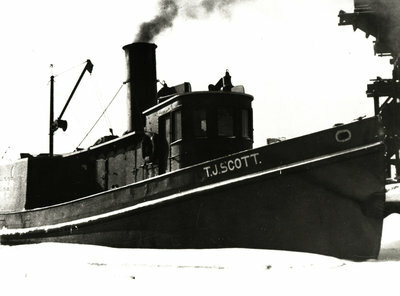 Author Scott Cameron is better known around the Lakes for The Frances Smith: Palace Steamer of the Upper Great Lakes, 1867-1896, but this is a picture of the tug named for his grandfather, T. J. Scott. The comments on this picture give a useful background to the history of the vessel and its activities in the waters around Sault Sainte Marie. 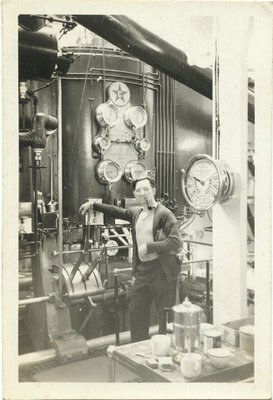 One of a group of snaphots from the collection of Tom Havers, who worked for the Columbia Transportation Company in the mid-1930s. Images arrive in a number of forms. 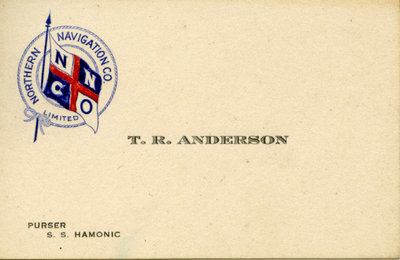 Here is the logo of the Northern Navigation Company on the business card of T. R. Anderson, scanned by his grandson.